Sistema Engineering Manager Oliver Jensen says that while the company is always looking for ways to keep costs down through automation, there were a few other reasons for prioritising the lid clipping process. "It was actually quite difficult for workers to physically apply the clips to the lids, especially when they were working long shifts to keep up with demand. The clipping process is also run offline, which means that that the lids are moulded and sealed first. They are then collected and clipped separately, meaning one automation solution would work for multiple products, as opposed to being restricted to one line." 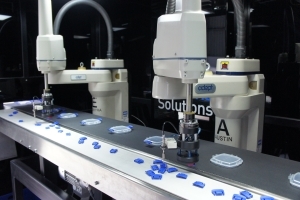 Having already worked with Sistema to successfully install a camera-guided robotic labelling system, ControlVision was tasked with integrating the hardware and software to enable the automation of the clipping process. A major challenge of the project was ensuring precise accuracy for the clip placement while maintaining a high speed on a moving conveyor, as there was a tolerance of less than 0.5mm for the clip to be successfully applied. It was also vital that the system could handle a wide range of lid sizes and shapes, as well as different clip colours. In the system, two conveyor belts carry the lids and clips separately in parallel. Encoder feedback is employed to enable the accurate tracking of the clips and lids on the moving conveyors. Upstream of the robots, a Basler Scout scA640-74gm camera captures an image of the clip, which is sent to the VisionServer software to determine its position. Once the position is determined, VisionServer guides one of the Dual Adept Cobra s600 robots into picking up the clip. A separate, higher resolution camera then captures an image of a corresponding lid, which is also processed by the VisionServer software to locate its position. This guides the robot into applying the clip, and the process is repeated for the second clip. As all lids have either three or four clips, the second robot applies the third and/or fourth clip downstream. 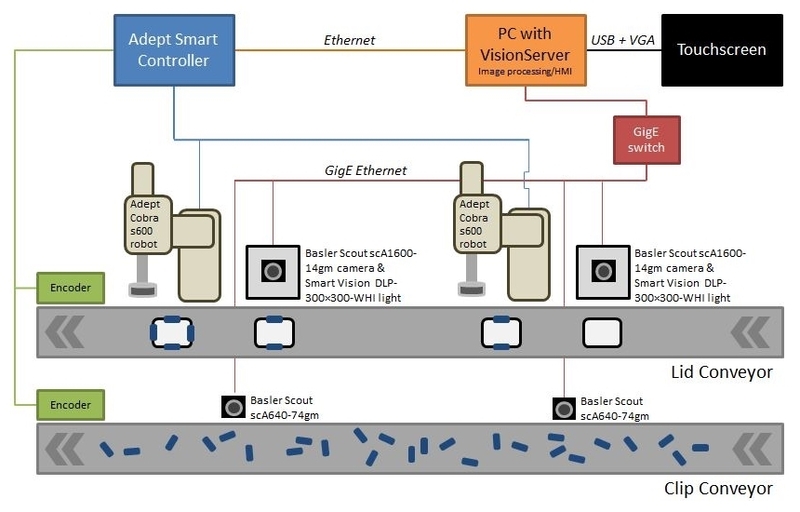 As well as managing the robot cell, ControlVision's VisionServer framework also acts as the human-machine interface (HMI) for the system, enabling easy configuration of parameters and monitoring of the whole operation. Since the clipper has been installed, clips are now applied to lids at a rate of one every two seconds. This equates to double the output of the previous process, with operators now able to run twice the volume of product. Another advantage is the system's versatility. 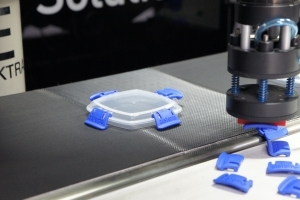 "There 's no product changeover procedure, any lid on the conveyor can be clipped since the system looks for any clip position on a lid, regardless of the shape or size. For example, even if we were doing a run of round lids, if there was a square lid placed in between them, the clips would still be applied," says Jensen. Thanks to the success of this technically challenging project, Jensen says Sistema is now considering the installation of additional camera-guided robot clippers to further production lines.